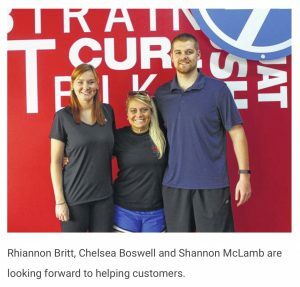 As the co-owner of Workout Anytime, Chelsea Boswell is ready to help people become healthier through cardio workouts and stronger when they lift weights. 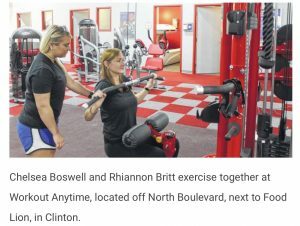 “We’re made for the busy people,” Boswell said about the gym, which is now open 24 hours a day, seven days a week. Marshall Heath is one of the clients who have access to the facility in the Northside Plaza. He said it’s good for Clinton to have a 24-hour facility for the health and welfare of the community. Boswell moved to the area at the beginning of the year after her husband became stationed at Fort Bragg. With four years of experience in the gym business, she hopes to make a difference in the community. She likes being involved with events such as 5K races and giving back. Boswell said she wanted to work for a nonprofit to change people’s lives. 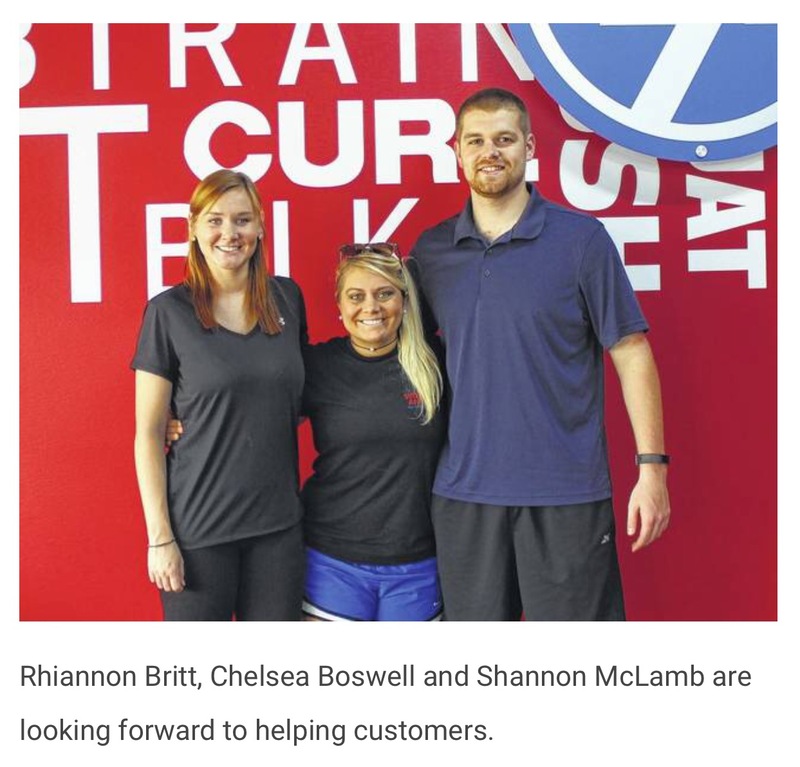 The fitness enthusiast hopes to help locally through Workout Anytime. Some of the personal matters those people may be dealing with involve divorces, trying to lose or gain weight, fitness competitions, eating disorders, stress, anxiety or depression. Prior to officially opening their doors, about 1,000 people signed up. Different membership levels are available for customers. For $15 a month, 24/7 access is available for amenities such as locker rooms, showers, weights and cardio equipment. Premium packages, available for $25 a month, include features such as the HydroMassage, a water-pressure massage bed, and a tanning bed. 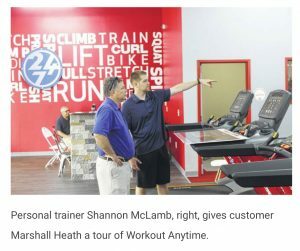 This level of membership also includes guest privileges during staffed hours and a fitness session with a trainer once a month. Another highlight is body test, which shows body fat, lean muscle mass and monthly improvements. Workout Anytime plans to expand into new territories through opportunities for entrepreneurs. Currently, there’s more than 100 locations throughout the United States. Randy Trotter, senior vice president of development, said Clinton was a perfect fit for Workout Anytime’s value-priced model. Like Boswell, he hopes more people have a healthier lifestyle by filling the void of not having a 24/7 gym. It took about two months to set up the gym. Boswell and co-owner Todd Devine plan to expand in another location, within a 15-minute drive. The Clinton facility is located at Northside Plaza, 337 North Blvd., Suite 50, Clinton. For more information about the Clinton location, visit www.workoutanytime.com/clinton.